Friedrich Ludwig Gottlob Frege was a German logician, mathematician and philosopher born on November 8, 1848 in Wismar, Germany to Karl Alexander Frege, and Auguste (Bialloblotzsky) Frege. Little is known about Frege's early life other than that he studied at a gymnasium in Wismar, graduating in 1869, after which he attended the University of Jena for four years of study. 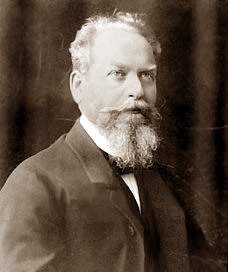 In 1873 he attained his doctorate at University of Göttingen, later returning to the University of Jena as a professor where he remained for the rest of his intellectual life. Frege's work went largely unnoticed during his own lifetime; however he has since become one of the greatest influences on twentieth century philosophy for his work in logic and analytic philosophy. Frege's logical works were revolutionary and his invention of 'quantificational' logic was the greatest development in that subject since Aristotle. It has replaced Aristotelian 'syllogistic' logic in most university courses. Frege regarded logic as the foundation for philosophy. In doing so he initiated a radical change from the position of the majority of Western philosophers who were mainly preoccupied with the nature of knowledge rather than with logic. Frege's work Foundations of Arithmetic, published in 1884, was a starting point for this foundation. In it he asks two major questions: What are numbers? What is arithmetical truth? In dealing with these questions he dismantles most of his predecessors' answers to them. "If I say the 'Venus has 0 moons; there simply does not exist any moon or agglomeration of moons for nothing to be asserted of; but what happens is that a property is ascribed to the concept 'moon of Venus', namely that of including nothing under it." Numbers are likewise objects, and just as in the statement 'Socrates is wise'; 'is' is an assertion about the characteristic of Socrates, so should the 'four' in the 'number of Jupiter's moons is four' be seen as identical with 'the number of Jupiter’s moons'. Frege defines the concept of 'having the same number as' by means of logical rather than arithmetical terms. Similarly Frege analyzed sentences in arithmetical terms of function and argument. The sentence 'Socrates is wise' contains a function '( ) is wise'. Socrates takes the place of argument for that function. This corresponds to the numerical example of '3 + 4' which can be analyzed as '( ) + ( )' being completed as the arguments '3' and '4'. Since neither the functional expression nor the argument assert anything individually and only when combined, it follows that the meaning of a term can only be given in the context of the sentence as a whole. Frege's philosophy of language ensues largely from his philosophy of mathematics. He argued that since meaning is primarily a property of sentences and derivative terms, we can then apply a distinction in meaning between the sense and reference of an expression. This sense/reference distinction has become the center of many current theories of meaning that try to show how language is connected to reality. Since the sense of an expression, according to Frege, determines what it refers to, there must be a fundamental connection between what we say and what there is. Frege's theory of meaning, especially his distinction between the sense and reference of linguistic expressions, was groundbreaking in semantics and the philosophy of language. His works set the stage for, and had a profound influence on, such thinkers as Bertrand Russell and Ludwig Wittgenstein. Frege is often called the founder of modern logic, and is sometimes even heralded as the founder of analytic philosophy.